Well, it's been just over a year, that this quilt has been on the frame at church. 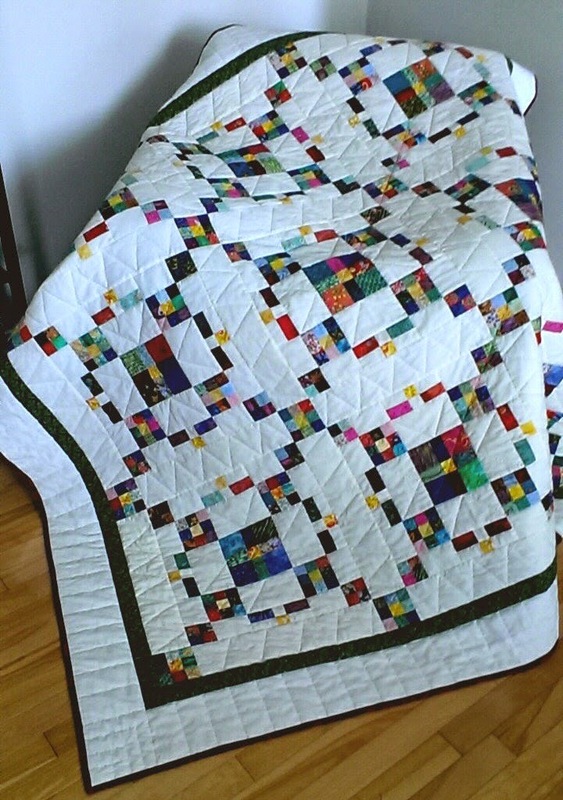 We are six regular quilters. I'm not sure I would call myself a regular quilter since I miss 3 or 4 months of the 9 month quilting year. It's always a great event when we get to take a quilt off the rack. We carefully unclamp, unpin and unroll. It's always a deep sense of satisfaction as we look over the front and back and admire our work under the guise of looking for missed lines of stitching. None to be found so we relax and enjoy a cup of tea before the next quilt goes on. I put the burgundy binding on this week at home. I'll do up a label this week and it'll be applied sometime before the quilt is raffled. I think it makes it's first appearance out in the raffle world this weekend. How can a broken needle be a good thing? We are in Moncton staying with grand daughters while mom and dad are cruising in Europe. I hesitate to say babysitting because we've not done a dish since we are here. The kids are awesome. They work the Netflix for us; take us on our daily 5k walk so we don't get lost, manage the garbage because they have different rules than what we are used to, and help us find things like the sugar. Since we will be here for a few days before the other grandparents come to relieve us, I thought I'd bring along the dancers quilt to work on while here. I was making good progress when I heard a loud snap .. Gesh .... Broken needle. My fabric folded under and I hit a darn safety pin. It took me half an hour to unpick the folded under fabric, and then I had no spare sewing machine needle. I run to the Quiltery to get needles. As I'm browsing the fabric, who do I see in the classroom, but a bunch of quilters from the Keswick guild. They were doing a pfaff club project. How fun to have a quick chit chat with them since I'm doing the program at their guild in a couple of weeks. So if I hadn't had a broken needle, I wouldn't have had the nice little visit. I'm making good progress. I've done a lot of the outlining and I'm starting to quilt the background. I'm using swirls around the trees. I'm undecided if I will quilt the trees. They are quite puffy. I'll sleep on it and let you know what I decide. I've said it before,.... Thank goodness for UFO's. A week or so before going on vacation, we found out that our grand-daughter Grace has to fund-raise for her new Dance Troop. They are developing various ideas to raise money. One of their ideas was to raffle a quilt and they asked if I would help out. At first, I thought, ohhh, how can I fit this into my busy schedule? You know, with classes, travel etc. Then I looked in my spare bedroom closet. That's where I keep all my near finished projects (or UFO's) I smiled when I saw this Winter Wonderland lap quilt, because I knew it would be a quick finish. 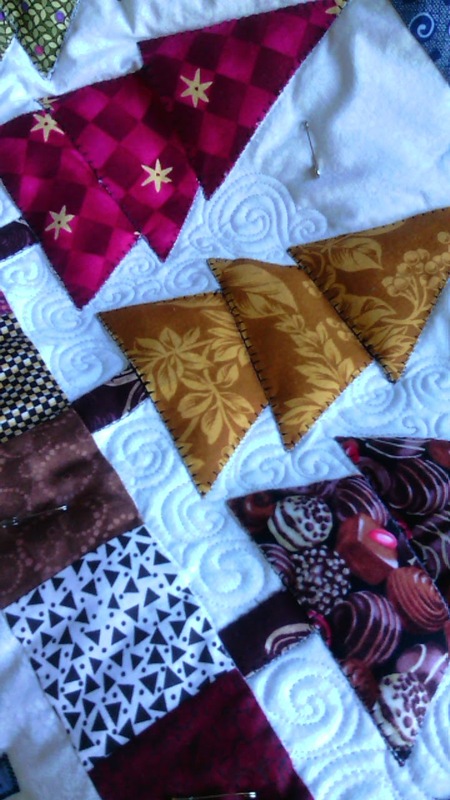 A couple of small borders and its small enough for me to machine quilt myself. It's a great Winter themed quit. Perfect for the dancers to sell lots of tickets on over the winter. If you are local, you will probably see me helping to sell a few tickets.. This was a "Row of the Month" project we did at the Cotton Mill Guild. 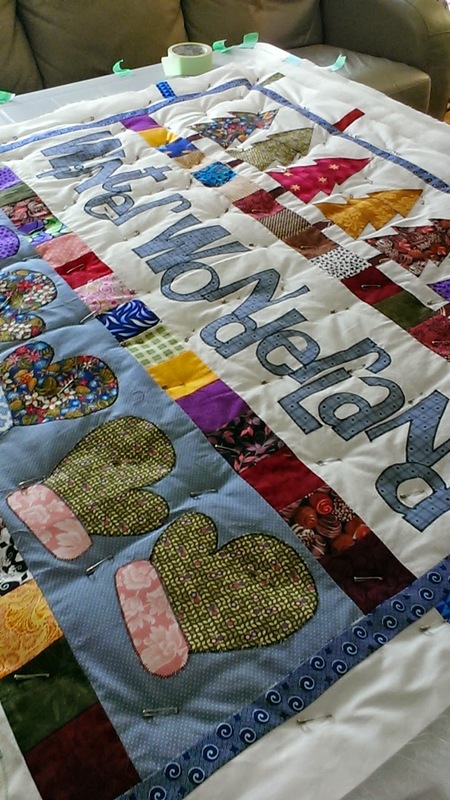 The borders are now done and I'm now layering and pin basting the lap size quilt. It makes me smile when I look at it. My husband helped me by closing the pins after I strategically put pinned the layers together. 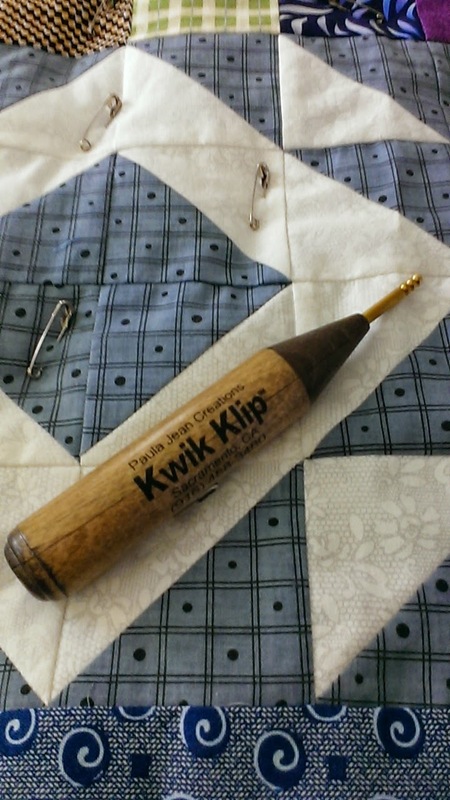 I find closing the pins hard on my nails so I bought this Kwik Klip tool last year. It is specifically made to close the safety pins. Anyway, he thought it was pretty good tool. So from the safety pin closer in this house, it receives a thumbs up. I'm really looking forward to my fall. I am teaching three classes to local groups. I've been preparing samples, photocopying class notes and ordering up any special supplies that I need. 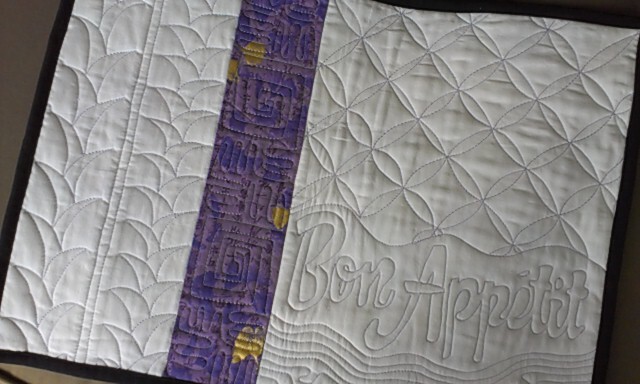 On Oct 25th, I'll be teaching a "Beyond Stippling" free motion quilting class. I really enjoy this technique and skill-building class because I know that half way through the class, I hear the "Oh, I Got It" from students. That's the big reward that teachers look forward too. Holly is hosting that class. 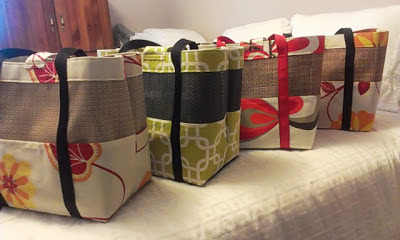 On November 22nd, I'm leading a project class at the Keswick Quilters Guild.. We will make a screen bag. I know that class is full and the fun part about that class is that I will have delivered the Guild Program to their entire guild earlier that week. On November 29th, I'll be leading a Batik Wallet class to the Fredericton Quilters Guild. I love making this wallet. 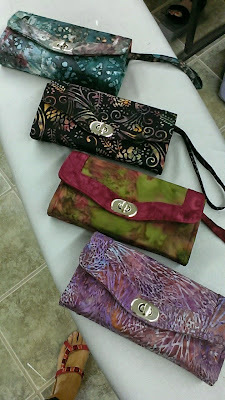 I've made many wallets and have lots of special tips and techniques to make this a show-stopper. You already know that Jeanie-Kay won a first place ribbon at the NB Exhibition this year. 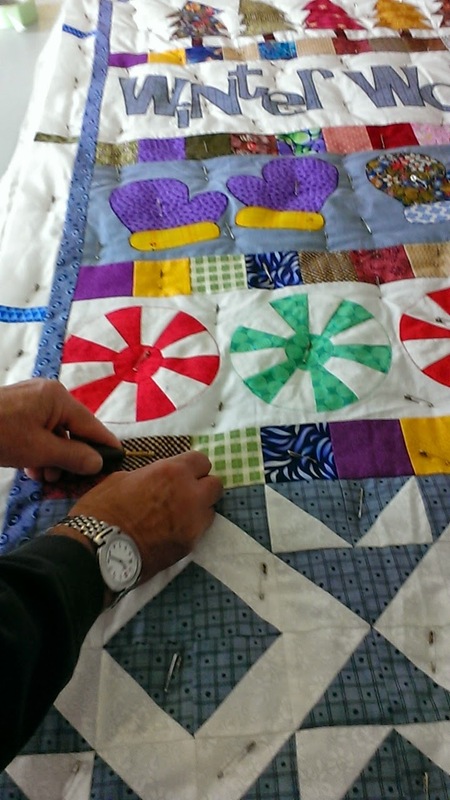 This is not a beginner class, so there might be a couple of spaces left after the Fredericton Quilt Guilds October 21st meeting. Maybe I'll see you in a class this fall!! It's time to get back in the groove after our fabulous vacation. I must say that Scotland and Ireland delivered everything I expected. It was a wonderful experience. Both the tour and the Ryder Cup experience. I thought I'd share something that I've never seen before around here. These are loaf liners. 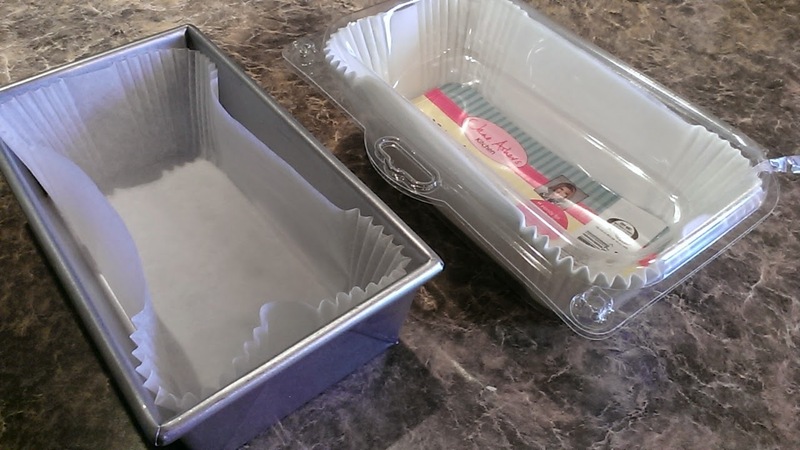 Like cupcake liners but for sweetbread loaves, like a banana bread or fruitcake. 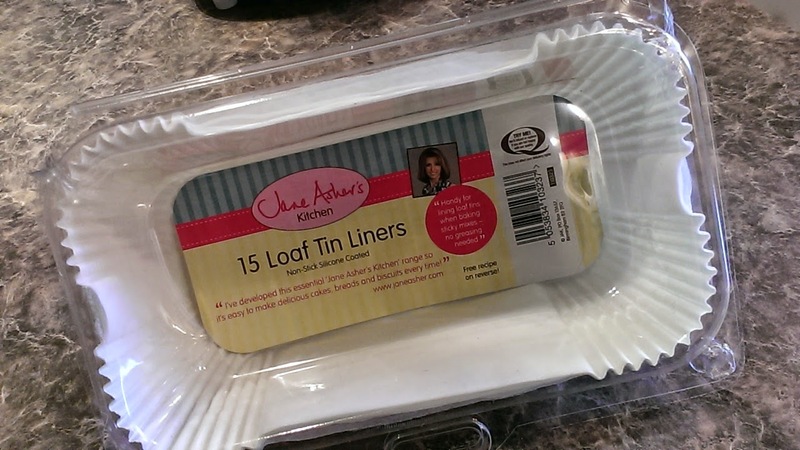 I bought this package if 15 loaf tin liners at the Pound Store in Scotland. It's like our dollar store. I'm going to make a couple of pumpkin breads today. Have you ever seen these? I think I'm going to really like them for making my fruitcakes this year. For me, the worst part of making a fruitcake is lining the pan with parchment. If you have ever bought these before, I'd love to know where you got them. I have a feeling I'm going to really like using them and will want more.